Various entrance times are available, choose from 16.00, 16.30, 18.00, 19.00, 20.00, 20.30, or 21.00. Berlin's TV Tower closes at midnight. Visit at sunset for a romatic dinner with city views. We are comparing Skip-the-Line: Berlin TV Tower Dinner Prices from leading ticket suppliers and Try to find you Cheap tickets prices on the market. 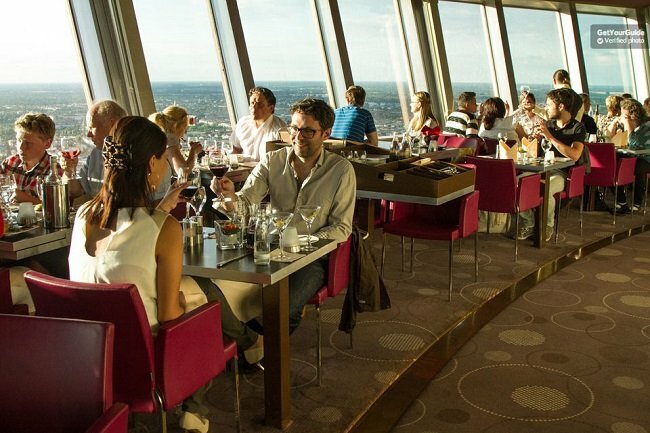 Enjoy a luxury wine and dine experience atop Berlin's famous TV Tower. Visited by over 1.2 million people each year, with a skip the line ticket you'll breeze past the queues and zoom up 203 meters in the tower's elevator. From the viewing platform you'll have panoramic city views, pick out many of Berlin's major landmarks and monuments and follow the curves of the River Spree across the city. The highlight of this VIP visit is an exclusive 2-course dinner served with a selection of sparkling and non-sparkling wines from the tower's 360-degree revolving restaurant. You'll be served a delicious main course with a savoury starter or sweet dessert, let your sommelier recommend the best wine to accompany your dish and watch as daylight fades and city lights illuminate the streets of Berlin. Dinner atop the Berlin TV Tower is can be a perfect way to spend a romantic evening with your special someone, watch the sunset and enjoy city views from the revolving restaurant. This can also be a unique sociable experience for friends or small groups. Your Experience With Skip-the-Line: Berlin TV Tower Dinner? Enjoy skip the line entry to Berlin TV Tower's and a luxury 2-course dinner in the revolving Sphere restaurant. Taste delicious wines chosen by you with the assistance of the restaurants expert sommelier. Gaze down at Berlin's city centre and enjoy a birds-eye view of its famous monuments, the Berlin Cathedral, Brandenburg Gate, Museum Island, and many more. What Skip-the-Line: Berlin TV Tower Dinner Includes? Skip the line entrance to Berlin TV Tower. 2 Course dinner with 1 glass of sparkling wine, 2 glasses of wine, and unlimited mineral water. Try to book at least a week in advance because the TV Tower is one of the most popular attractions in Berlin. Travelers Reviews about Skip-the-Line: Berlin TV Tower Dinner? One of the top-rated attractions in Berlin, dinner at the TV Tower is a fantastic highlight to your city break. The evening experience has average scores of 4.5 out of 5 on Get Your Guide, TripAdvisor and Viator. Customers praise the food and service in the Towers restaurant and say that the views are magnificent. Please bring a printed or E-ticket, you must scan this at the entrance on arrival and departure. Tickets for this event are refundable however cancellation policies will vary depending on you tour provider. Cancellations made less than 7 days in advance may be subject to cancellation fees. Extra drinks and tips are not included in the ticket price. If an evacuation is called the elevator will not operate. For safety reasons visitors with severe walking difficulties and wheelchair users are not permitted to enter. Entrance Point: Level 1 of Berlin TV Tower at the security check point.